Note: I do not know what I was thinking when I praised this movie so much. Hopefully, I will one day write a review that is closer to what I think of the movie. Has there ever been a more badass movie that The Expendables? I honestly can not think of one off of the top of my head. This movie is packed to the brim with one-liners, over the top action scenes, and almost every character gets a true blue badass moment. The movie is about a team of five guys (you are going to have to guess which ones they are. 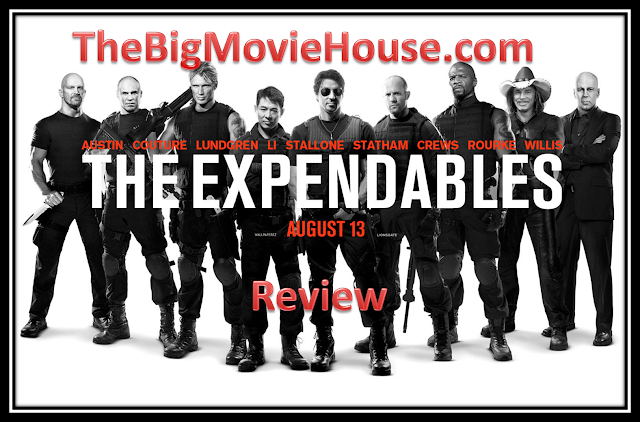 ), who call themselves The Expendables (catchy, right?). They are mercenaries for hire. They don't really have any type of lives outside of the group (except for Statham, no one has a wife or a girlfriend or even a pet of some type.). These guys live and breathe the group. They get a mission from Bruce Willis to go into a fictional country in South America and kill the general who has overthrown the country. The scene where Stallone gets the mission from Willis includes a cameo from Gov. Schwarzenegger as Stallone's rival. This scene is pretty pointless other than to get the three action stars in the same room and crack jokes at one another expense. The scene is pretty funny and badass at the same time. Stallone and Statham go to the country to check and see if the job is doable. They meet up with a female contact who happens to be the general's daughter. 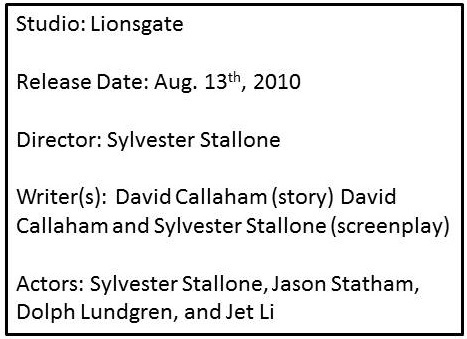 After the three are shot at and chased back to their plane, Stallone and Statham decide that the mission is too risky. But the general's army kidnapped the girl and Stallone decides that saving a life may redeem him for some of the lives him and his team took. His team seems to think the same thing and soon they are sneaking into the general's compound. The story here is not one to write home about. Since there are so many characters, there is very little room for character scenes. In fact, Li's character scene takes place during a high speed chase. But we didn't come here for deep, meaningful discussions. We came here for badass scenes and moments and we get more than our fair share. Everyone gets their moment to shine. Stallone is can shoot and reload a gun faster than I believe is possible. Statham can throw a knife with enough accuracy that he can knock off your head. Li, of course is a martial arts master. Couture is a fist fighter. But I think that Terry Crews gets the best, most badass moment. Crews has a gun that is a mix between a machine gun and a shotgun. The moment that Crews starts using the gun is one of the best moments in the movie. The fight between Dolph Lundgren and Jet Li is pretty cool as well. The scene was choreographed by Corey Yuen and is one of the highlights of the movie. Just imagine tall as a giant Lundgren against tiny Li. 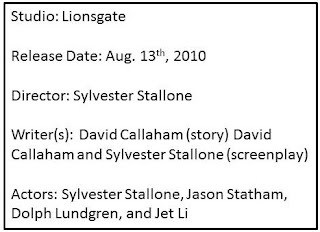 The only real problem that I had with the movie is that Stallone went nuts in editing room. There are shots that fly by so quickly that we can barely tell what is going on. Had Stallone let shots linger a bit more than this movie would have lived up to the 80's mentality. As it stands, The Expendables is a really fun movie to watch. This movie has to hold the record for number of badass moments. The Expendables is one of the best movies of 2010 and gets my vote for the most badass movie of 2010.